Sign the petition "Shame on the Media for Accusing the TeaParty for Being Responsible for AZ Massacre" and make it viral! New meme developing! Palin has placed a video reaction on her Facebook page, referring to this outrage as 'blood libel', a term traditionally reserved for Jews being falsely accused by Christians. Leftist Alan Dershowitz is defending Palin's use of the term. It took about a split second for some Leftist cook to hint at Tea Partier involvement in the shooting of Jewish Blue Dog Congresswoman Rep. Danielle Giffords (D-AZ). This was almost at once picked up by the international spinner tweet chorus (picture). Apparently the smear originated with Giffords' elderly father (NYPost). This was answered by Pamela Geller on Atlas Shrugs, who took the trouble of going through Loughner's YouTube account. It seems Hitler and Karl Marx are among his favorite authors, but then again, it seems that Orwell's Animal Farm, Brave New World, and Plato's Republic also touch the Loughner book shelves. Geller has more on the Leftist framing machine that is spinning like a top on steroids, and which has by now has just about everyone involved, from media pundits to politicians and hacks. And while according to the Left, the Right should not jump to conclusions linking Giffords' Jewishness to Loughner's Mein Kampf, they insist TeaPartier involvement and Sarah Palin's responsibility are a forgone conclusion. As if eight very long years of Bush Derangement Syndrome never existed, the Left is agreeing that political hate speech is now completely out of control. They should know. 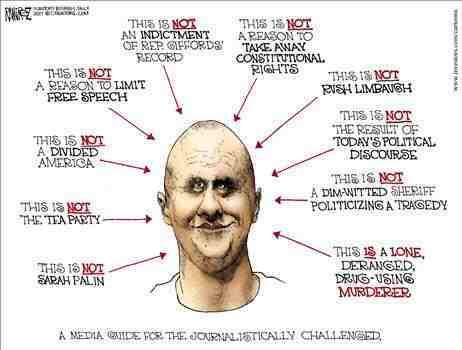 But in all honesty and objectivity, Loughner seems to be just another politically confused paranoid. Yep, concurs Richard Fernandez. While this is going on and World War III just about seems to have broken out, award winning Keynesian economist, Paul Krugman thinks Sarah Palin's graphics are just a wee bit over the top, targets and all. But as Verum Serum is pointing out, the Obama's enemies' lists and talk on the Daily Kos of 'behind enemy lines' are all a good day's work for the Left (hat tip: DutchReaganite). Roger Kimball on Pajamas has more on the hate mongering of 'hack columnist Krugman': "everything he wrote is a lie, including “and” and “the” (...) Isn’t it time that the management of the New York Times “took a stand” against such malevolent imbecility? I mean, the man “searches in vain” for what is right in front of his face — but if it conflicts with his left-wing narrative, he doesn’t see it. My God, the man can’t even use Google!" In the mind of the Left this is all perfectly explicable. But you need an subjectivist's mind to get your head around that one. We are to understand that the difference is, the Daily Kos (and presumably also the massive New York Times) is 'marginal', while the clout of the Tea Party is carried by 'large swathes of the establishment'. At a loss? You see, it works like this. The Left is all about the redistribution of power. They do so by lumbering the top dog (the US, Israel, the power structure, the military industrial complex, the Tea Party, what have you) with a number of handicaps. They are allowed only a fraction of what the under dog is permitted to do (terrorism, (r)aid flotillas, martial graphics, hate speech, lumping, racism, the Daily Kos, the NYT, etc.). This logic leaves the Left in a permanent state of bigotry. This is exacerbated by group thought that is rife among the Left! A a matter of course they judge each inequal 'group' by different standards. Hypocrisy is the postmodern Left's middle name! - Pajamas Media entire coverage of the subject: "Shooting in Tucson"
- The Moderate Voice: "Politicizing Murder, An Arizona Story"
Krugman is taking exception to Palin martial charts! The gall! 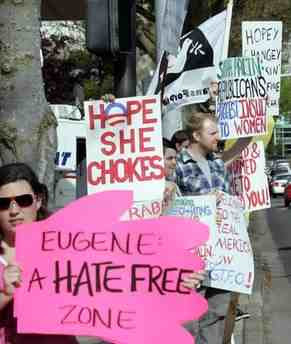 Michelle Malkin has compiled some products of the Leftist hatred machine. So who's responsible for current climate? Rumor has it the shooter of Giffords, Loughner voted for Obama. Seeking confirmation. Update: no, that would be Independent. He didn't vote in 2010. Days before the attack on Gifford the Leftist blog, Daily Kos has been ginning up feelings against Blue Dog Dem Giffords for voting against komisar Pelosi! La Geller brings home the bacon by posting a screen shot, taken before sanitation efforts took it down. 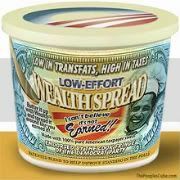 David Limbaugh stresses the Democrats' conscious strategery behind the spin. The Economist: "Krugman's toxic rhetoric"
HOW did a deadly shooting spree by a disturbed young man with the typically inscrutable politics of political killers turn into a crazy referendum on the state of American political discourse? Mere minutes after the identity of the alleged Tucson gunman hit the wires, partisans began a reprehensible scramble to out Jared Loughner as ideological kin to their political opponents. Actually, well before that time, some left-leaning opinionators began suggesting that Sarah Palin's now-infamous crosshairs map probably had something to do with the shootings. 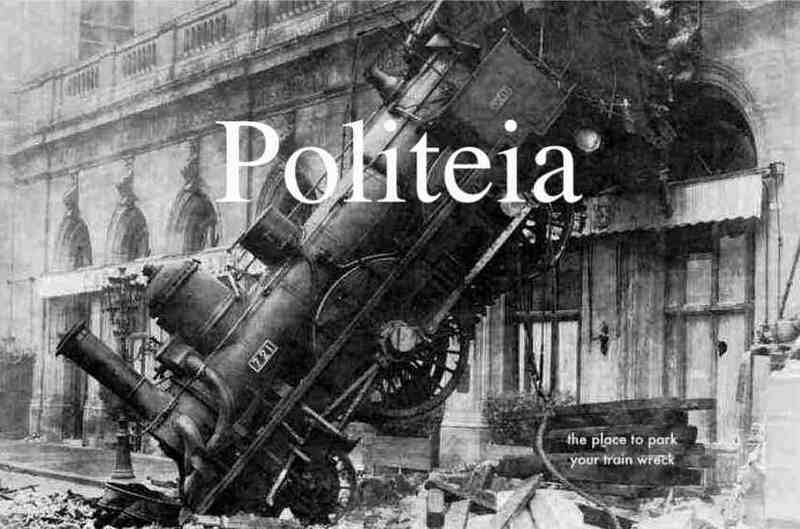 - "The Political Pathology Asylum"
They're astounding and yet their reaction is that they are the good guys. This is and always has been the sticking point - they really believe we are the bigots and hate merchants. The clearest symptom by which one can recognize [the amoralist] is his total inability to judge himself, his actions, or his work by any sort of standard. The normal pattern of self-appraisal requires a reference to some abstract value or virtue—e.g., “I am good because I am rational,” “I am good because I am honest,” even the second-hander’s notion of “I am good because people like me.” Regardless of whether the value-standards involved are true or false, these examples imply the recognition of an essential moral principle: that one’s own value has to be earned. I think this describes the Narcissist.